Are you trying to figure out how to start paying off your debt? Looking for a place to start? Consider the debt snowball. The basic plan is pretty straight forward. First make sure you save up either enough money to pay 3 to 6 months worth of bills or a $1000. Next, make a list of all of your debts. Be specific and list what you owe to each creditor. Write it down so you can see it. Figure out how much extra money you can afford to put on your debt each month. Take that amount of money and put it on your smallest debt. Continue to pay the minimums on your other debts. Never miss a payment! When you finish paying off your smallest debt, take the money you were sending on that and roll it into the minimum you are already paying on your next smallest debt. Now apply that full amount to this second smallest debt. When it is paid off, roll all of that onto your third smallest debt along with the minimum you were already paying there. It is called a snowball because it gets bigger as it rolls away. Keep doing this and you can pay down those debts faster than you would think possible. Many well meaning people will tell you to pay off your highest interest rate first. This is a valid point as it saves you interest charges. 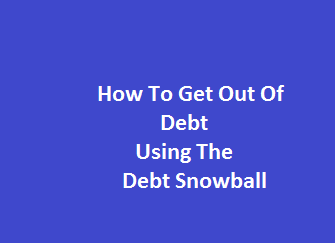 However, if you follow the debt snowball, you will keep increasing the amount that is going to pay down principle. This is a wonderful thing for your spirit. Soon you can say you paid off 1 whole debt, then 2, then 3 loans gone! Your whole outlook on life is improved by being able to say that. Give it a try and see what I mean.